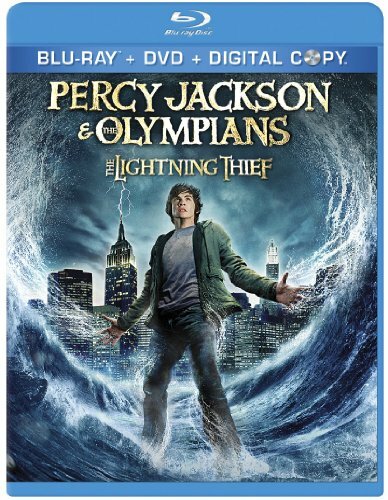 Order ‘Percy Jackson & the Olympians: The Lightning Thief’ [Blu-ray], available from Amazon.com by clicking on the DVD cover above! How do the movie studios follow the humongous, year-after-year success of the Harry Potter movies? That is, where do you find a character and situation that will grab the imagination of everyone from elementary school students on through your grandmother? And craft tales that will make audiences come back for more? Again. And again. And again. The answer wasn’t Lemony Snicket, although a lot of people thought it would be.Maybe Rick Riordan’s got it. Riordan created a young adult novel series called Percy Jackson & The Olympians about the mythological gods and monsters coming to life in modern day circumstances with only a trio of unusual high school students standing between us and them. I smell a formula, but the kids love the series. Now a movie based on the first book, Percy Jackson & The Olympians: The Lightning Thief, opens in theatres on Friday, February 12. The trailers look very cool and any resemblance to Harry Potter, the Hogwarts School and all the rest is surely intentional—and who could blame the producers? Joining me today is one of the poor bastards upon whom the cinematic weight of the world is apparently resting, one week out from the picture’s debut. But I suspect screenwriter Craig Titley, who adapted Rick Riordan’s story for the silver screen, can handle the pressure. Maybe you’ve seen some of his previous films, including the original Scooby-Doo live-action film—it grossed more than $100 million. He also co-wrote the Steve Martin movie, Cheaper By the Dozen—which also grossed a hundred mil.